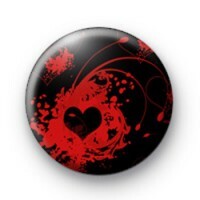 This is a black 25mm /1-inch badge with a red gothic pattern and a love heart on the front. It's a pretty design and something a little different for using in your Valentine's craft projects. It would look lovely pinned to your coat or bag as a subtle symbol of love. We have lots of alternative love, Valentines and romantic themed badges in the shop, so be sure to take a browse through those too.